Autoproliferation of B and CD4+ T cells upon addition of the selective BTK inhibitor ibrutinib or vehicle (DMSO) control (left graph). Right graph shows the HLA-DR expression (line) and survival (numbers) of B cells (mean ± SEM; n = 3 REM). Spebrutinib (CC-292, AVL-292) is a covalent, orally active, and highly selective BTK inhibitor with IC50 of <0.5 nM, displaying at least 1400-fold selectivity over the other kinases assayed. Phase 1. Effects of AVL-292, CNX-774 and dasatinib on IgE-mediated histamine release in human basophils. Basophils (BA) obtained from three nonallergic donors (A). CNX-774 is an irreversible, orally active, and highly selective BTK inhibitor with IC50 of <1 nM. RN486 is a potent and selective BTK inhibitor with IC50 of 4 nM. BTK inhibitor 1 (compound 27) is an inhibitor of BTK with an IC50 of 0.11 nM for Btk and inhibits B cell activation in hWB with an IC50 of 2 nM. Fenebrutinib (GDC-0853) is a potent, selective, and non-covalent bruton's tyrosine kinase (BTK) inhibitor with an Ki value of 0.91 nM for Btk with >100-fold selectivity over 3 off-targets (Bmx :153-fold, Fgr: 168-fold, Src:131-fold). BMS-986142 is a potent and highly selective reversible small molecule inhibitor of BTK with an IC50 of 0.5 nM. In a panel of 384 kinases, only five kinases were inhibited by BMS-986142 with less than 100-fold selectivity for BTK (TEC, ITK, BLK, TXK and BMX). Evobrutinib is a highly selective BTK inhibitor with an IC50 of 37.9 nM. It has potential anti-neoplastic activity. ARQ 531 is an ATP-competitive tyrosine kinase inhibitor designed to target BTK with an IC50 of 0.85 nM. It also has a distinct kinase selectivity profile with strong inhibitory activity against several key oncogenic drivers from TEC, Trk and Src family kinases. Btk inhibitor 2 is a BTK inhibitor. BMS-935177 is a potent, reversible Bruton's Tyrosine Kinase (BTK) inhibitor with an IC50 value of 2.8 nM and demonstrates good kinase selectivity. It is more potent against BTK than other kinase, including the other Tec family kinases (TEC, BMX, ITK, and TXK) over which the compound is between 5- and 67-fold selective. 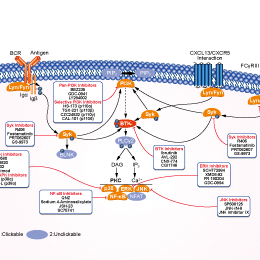 LFM-A13 is a specific Bruton's tyrosine kinase (BTK) inhibitor with IC50 of 2.5 μM, >100-fold selectivity over other protein kinases including JAK1, JAK2, HCK, EGFR,and IRK. Cell-free kinase assay of IFN-gR2 phosphorylation at Y289 by constitutively active BTK with or without BTK inhibitor LFM-A13 (100 mM). WCL, whole-cell lysate; DIC, differential interference contrast microscopy. ONO-4059 analogue is an analogue of ONO-4059, which is a highly potent and selective oral BTK inhibitor with IC50 of 23.9 nM. Phase 1. Olmutinib is a novel third-generation epidermal growth factor receptor (EGFR) mutation-specific tyrosine kinase inhibitor (TKI). Also a potent inhibitor of Bruton's tyrosine kinase. Acalabrutinib(ACP-196) is a selective second-generation Bruton's tyrosine kinase (BTK) inhibitor with an IC50 of 3 nM, which prevents the activation of the B-cell antigen receptor (BCR) signaling pathway. ACP-196 has improved target specificity over ibrutinib with 323-, 94-, 19- and 9-fold selectivity over the other TEC kinase family members (ITK, TXK, BMX, and TEC, respectively) and no activity against EGFR. Comparison of the impairment of ADCC against primary CLL cells by different irreversible BTK inhibitors. The antibody-dependent increase in the percentages of minimal calcein retention was determined with 3-fold excess of 1708-LC3E11 effector cells over CLL target cells in seven independent experiments. (a) Asterisks above the boxes and whiskers denote the significance of enhanced cytotoxicity compared to the control without addition of antibodies and inhibitors as determined by paired t-tests. Furthermore combination treatment was compared to that with anti-CD20 antibodies as single agents. (b) The mean differences ± SEM in the cytotoxicity against CLL cells in the presence and absence of rituximab and obinutuzumab were calculated from the data shown in (a). The ADCC of rituximab and obinutuzumab was compared by paired two-tailed t-test. *p<0.05; **p<0.01; ***p<0.001. CGI1746 is a potent and highly selective small-molecule inhibitor of the Btk with IC50 of 1.9 nM. IL-1β cleavage (A, B) in platelets activated by collagen or thrombin is reduced in the presence of the BTK inhibitor CGI1746. ONO-4059 (GS-4059) is highly potent and selective BTK inhibitor with an IC50 of 2.2 nM.